Mexico is safe! Now that it has been said, how do you feel about it? It really depends on what you believe to be truthful. Do you believe the media? Do you believe the U.S.A. government? Do you believe those who live and work in Mexico? Since there are differing opinions about whether Mexico is safe, someone must be telling the truth and someone must be, well… stretching the truth a bit. We will get to the truth in a bit, but first some facts about Mexico and violence. Much of the information in this article is based on the advisory on the U.S.A. State Department website. It is a controversial site worth reviewing as part of a complete snapshot of the safety issues of one of the world’s most fascinating destinations. Fact: Mexico is safer than other popular travel destinations! Mexico, one of the world’s great travel destinations, is often singled out for violent crime without telling the whole story. While there is sporadic violence along parts of the U.S. border, the majority of Mexico’s key tourism areas are not only safe, but safer than many other popular tourism areas. Many believe that they are safer in Jamaica, the Bahamas, Brazil, the Dominican Republic or even Honduras. A look at the chart below should be an eye opener. It gives the number of homicides per 100,000 population. As you can see, Mexico is far down the list compared to some of the favored travel destinations in Latin America. Fact: The assault rate in the U.S. is nearly 5 times greater than that of Mexico! While the U.S.A. Government often portrays Mexico as the most dangerous place on earth in their travel advisories, it is statistically quite safe. According to NationMaster.com which uses U.N.-based data, Mexico doesn’t even make the list of the 36 nations with the highest murder rates. Mild-mannered nations like Sweden and Switzerland top Mexico for murders on NationMaster.com. In truth, the assault rate in the U.S. is nearly 5 times greater than that of Mexico in the independent Prominix report adjusted for under-reported crime. That’s right, you are 5 times more likely to be assaulted on the streets of Austin, Texas (The Live Music Capitol of The World) than in Cuernavaca, Mexico, a city of comparable size! Fact: Mexico is safer than many cities in the U.S. Fact: Mexico City is more than twice as safe as Washington D.C. The U.S. State Department in Washington D.C. issues warnings about Mexico, yet Washington D.C. is four times more deadly than Mexico City. Washington’s murder rate has been cut almost in half in the last 10 years, but it still averages 21 per 100,000 vs. only 9 per 100,000 in Mexico City. How do you suppose the U.S. State department would feel if the Mexican government posted travel warnings for the U.S.A. capital? Mexico City is a cultural treasure that is larger than New York, London or Paris. In fact, it is about the same size as London and Paris combined. Fact: The Murder Rate in New Orleans is 5.45 Times higher than Mexico City. New Orleans is beloved and its renaissance is showcased in the news. The FBI reports the murder rate of New Orleans is declining, but it is nearly 4 times higher than all of Mexico and 5.45 times higher than Mexico City. New Orleans is still an amazing place to visit and the media is right to champion this inspirational city. But Mexico is at least as remarkable and there is a clear difference in how each of these storied destinations is portrayed in contemporary news. Fact: The State of Yucatan is among the safest resorts in the world! The magnificent beaches and ancient ruins of the Mexican State of Yucatan are among the safest and most spectacular resort beaches in the world. Yucatan’s low homicide rate is slightly lower than the rural U.S. States of Wyoming, Montana, Oregon and Maine. While the media often portrays Mexico as the most dangerous place on earth, it is statistically quite safe. According to NationMaster.com which uses U.N.-based data, Mexico doesn’t even make the list of the 36 nations with the highest murder rates. Mild-mannered nations like Sweden and Switzerland top Mexico for murders on NationMaster.com. The assault rate in the U.S. is nearly 5 times greater than that of Mexico in the independent Prominix report adjusted for under-reported crime. Even when we add on independent estimates for unreported homicides, Mexico ranks 21st behind many popular vacation destinations. 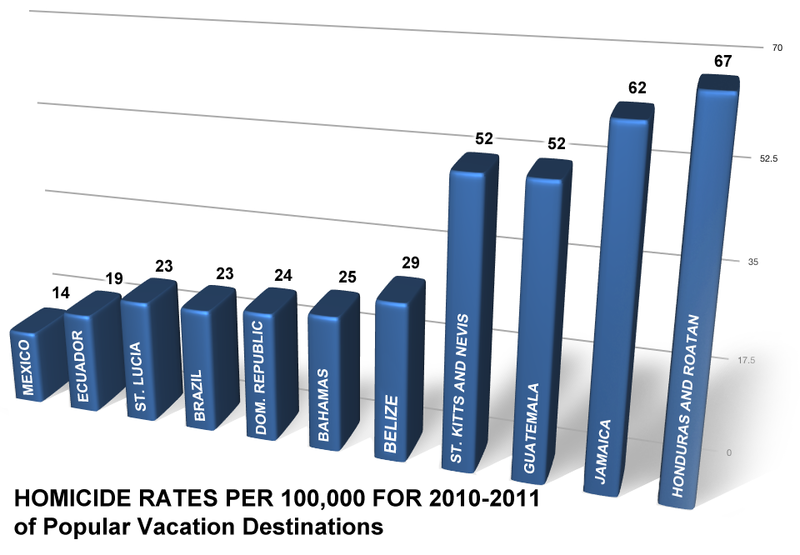 Places we think of as idyllic Caribbean retreats have double, triple, even quadruple the murder rates of Mexico. Mexico’s famous vacation areas are even safer than the averaged statistics, and even safer still for tourists. After months of sensationalized stories about Mexico’s border violence, USA Today realized the error of following along on what they led to believe they should run, and finally published a story about the media hype. While the story itself became an opportunity to re-tell some sensational tales, it did set the record straight by finally comparing U.S. and Mexican homicide figures. Fact: Only 383 of the 9,330 kilometers of beaches are on the advisory list. Mexico has a 9,330 kilometer coastline, of which 7,338 kilometers face the Pacific Ocean and the Gulf of California, and the remaining 2,805 kilometers front the Gulf of Mexico and the Caribbean Sea. Of the four states on the advisory list, only the state of Tamaulipas has beach front, which consists of only 383 kilometers. For those who enjoy sun and surf, you still have 8,947 kilometers (5,559 miles) of beautiful beach to enjoy! Fact: 27 of the 31 Mexican States are safe to travel and vacation. The U.S. State Department’s warning recognizes that Mexico’s tourism areas do not experience the safety issues seen along the Texas border. In fact, of the 32 Federal entities of Mexico, 27 States and the Mexico City Federal District have no advisories or limited advisories outside of their tourism areas. The U.S. State Department recommends against travel to 3 states along the Texas border and the state of Durango because of cartel violence. These are the States where cartel violence has been focused. Like all places, travel outside of the touristic areas may place you at slightly higher risk. Mexico is huge, ranking 14th in the world, and spanning over 2,000 miles from end to end. Mexico is a nation of 31 states which, with the Federal District, comprise the 32 Federal Entities of Mexico. The states are as diverse as those in the U.S. and the country is larger than the states from Texas to Maine. Canceling a vacation to Mexico because of isolated border violence would be like canceling a vacation to Orlando because of the Boston Bombings. People didn’t cancel trips to Dallas or New Orleans in the aftermath of mass shootings in Arizona, Colorado or Connecticut, because they simply aren’t related. Yet Dallas and New Orleans are closer to border violence than many of Mexico’s peaceful tourist areas. Fact: Politicians throw fuel on the fire creating a media bias. Fact: Politics & profits drive sensational media. Why is Mexico shown in a negative light? There is money to be made by sensationalizing violence. Drug cartels launch graphic attacks to secure and protect their turf. Media firms hype stories to sell more ads or magazines. And powerful politicians have an interest in slowing the growth of Latino voters in the U.S. Each group enhances perceptions with ulterior motives. The reality is simple: if you are in the drug trade looking for trouble, you can find it. If you are visiting Mexico’s touristic areas, you are safer than you are in many U.S. touristic areas. Fact: Cartel violence has never targeted tourists or touristic areas. The U.S. State Department recommends against travel to 3 states along the Texas border and the state of Durango because of cartel violence. These are the States where cartel violence has been focused. It is irresponsible to suggest that every inch of any country or state is completely safe or unsafe. So it is important to note that the violence in the 4 states above does not specifically targets tourists, making it statistically less likely that tourists will become victims. Yet, the crime rate in those areas is significantly above the national average. Those wishing to avoid the 4 states identified by the U.S. State Department have 27 other states and the Mexico City Federal District to explore that are statistically safer and at least as beautiful. Travel safely. No International Terrorism – The possibilities of terrorist attacks in Mexico are almost non-existent. Mexico’s low profile foreign policy insures that the county has no enemies to fear, nor do others fear Mexico. No National Terrorism – Mexico is not affected by internal terrorists which involves random killing, such as the ETA (Spain) or the FARC (Colombia). Mexico has no armed opposition since the peace agreement with the only existing guerrilla organization, the Zapatistas from Chiapas state. With the exception of a few days early on, the Zapatistas have confined their battle to the internet. Low Crime Rate – Mexico’s crime rate is far below the international average. 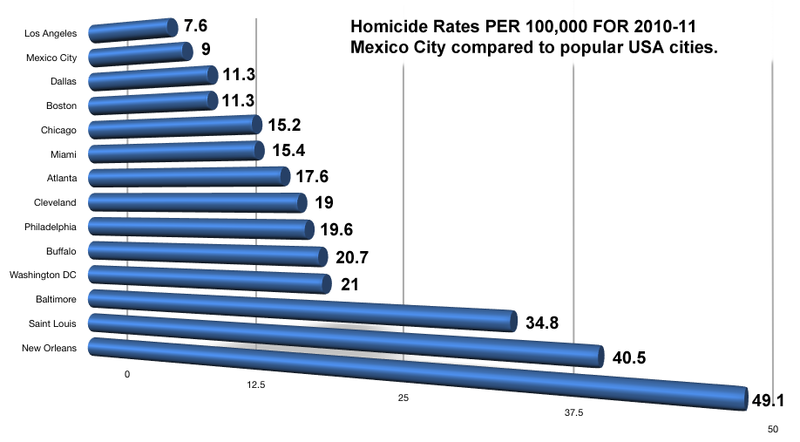 In Cuernavaca, the crime rate is lower than in major US or European cities. Crime in Mexico is located in well defined and avoidable zones in Mexico City (e.g. Tepito). Almost 20% of the Mexican GDP is generated from tourism, which guarantees that foreigners and the facilities they use (hotels, language schools, archaeological sites) are well protected by Mexican Federal Police and the ministry of Tourism. No cases of violence against foreigners has been reported in the last few years. First Class Infrastructure – Although some regions in Mexico (particularly the Southeast) are underdeveloped, the cities (including Cuernavaca) offer all the facilities and comforts that can be found in any other industrialized country. More than 7000kms of recently built highways and 6 national airlines (4 of them flying to Europe, Canada and the US) connect all cities and tourist locations. First Class Medical Facilities – Mexico is one of the few countries in Latin America with first class doctors and medical facilities. In effect, thousands of US citizens fly yearly to Mexico for Medical care, as it is of similar quality as in the US, yet up to 80% cheaper. A travel insurance policy is a good idea. With it, the visitor can be assured of first class medical assistance, if needed. Social and Political Stability – Since the past presidential elections in 2000, Mexico is internationally recognized as a democratic country. Clean elections chose a candidate form the opposition as president for the first time in 71 years. All political forces are represented in congress, guaranteeing a political stability unimaginable in most other Latin American countries. Biggest Spanish Speaking Country – Mexico is the biggest Spanish speaking country in the world, and is more than a country of tequila sunrises, Coronas, deserts and white beaches with clear Caribbean waters. Eighth Economic Power in the World – Mexico is the eighth most important economic power in the world, a top oil exporter, and the second most important trade partner for the US. Of the 500 richest people of the world, twelve of them are Mexicans. However, more than 50% of the population is considered to be poor, or very poor. Several hundreds of thousands of Mexican children are homeless, without access to schooling (although education is obligatory and free in Mexico), and lacking basic health care.